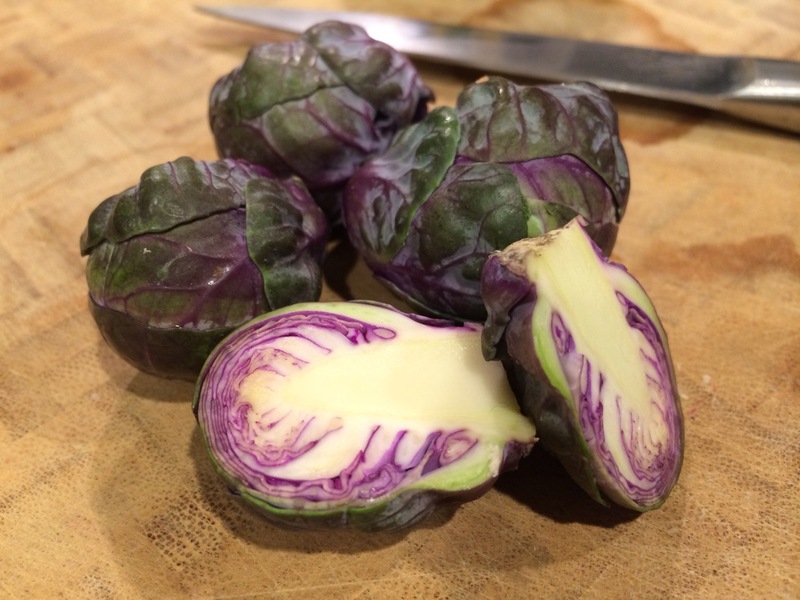 The original blog post for this recipe was written back in 2008, but I still refer back to it regularly. It’s time for a redo and some basic edits to include photos. I actually cooked a roast chicken last night, so what better time to do an update?! 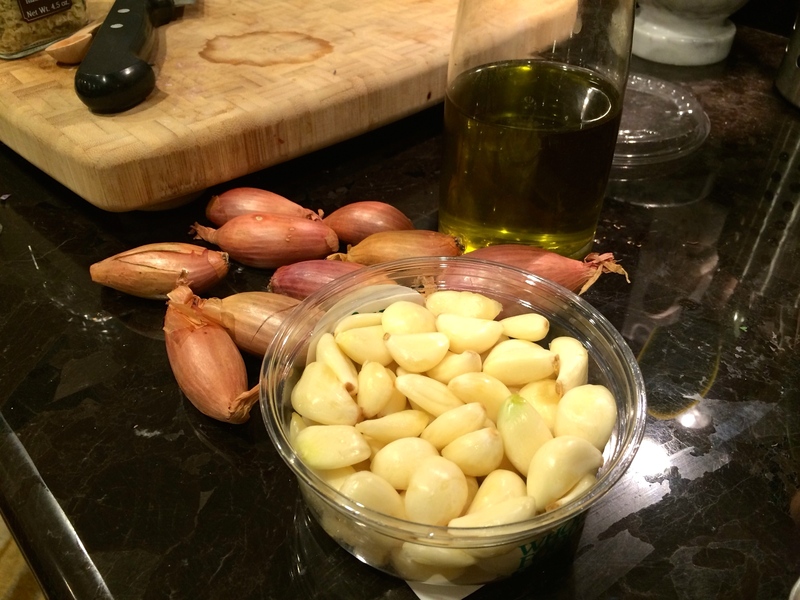 Last night’s ingredients are below, as well as directions and photos…. However, I’ve included the original blog post at the end, in case you like that combination of ingredients better! 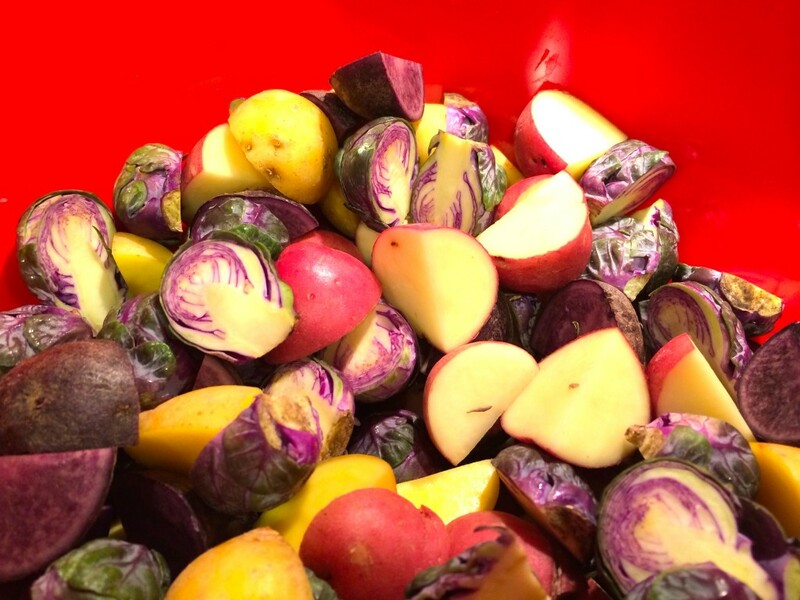 In a large bowl, combine the chopped potatoes, shallots, brussels sprouts and garlic cloves (or vegetables of choice). 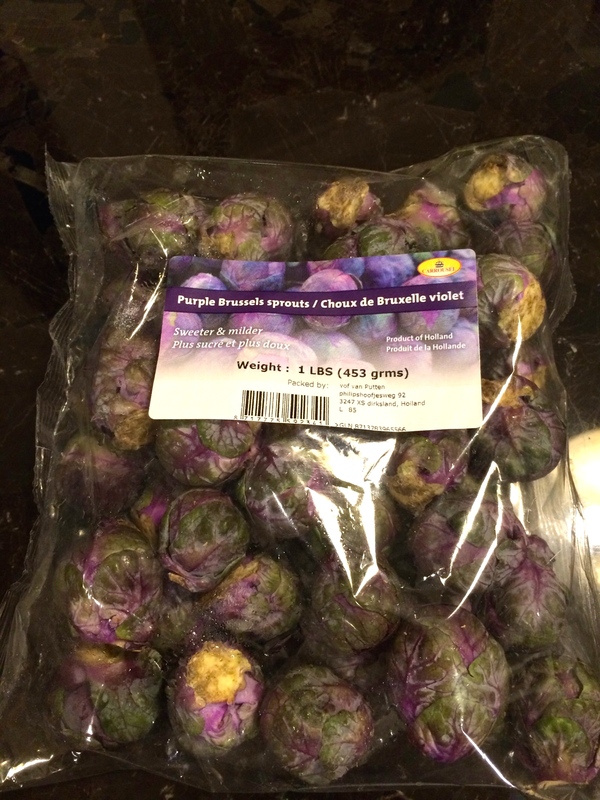 Season heavily with EVOO (I probably use about 1/8-1/4 cup), fresh ground pepper, salt and seasoning of choice. 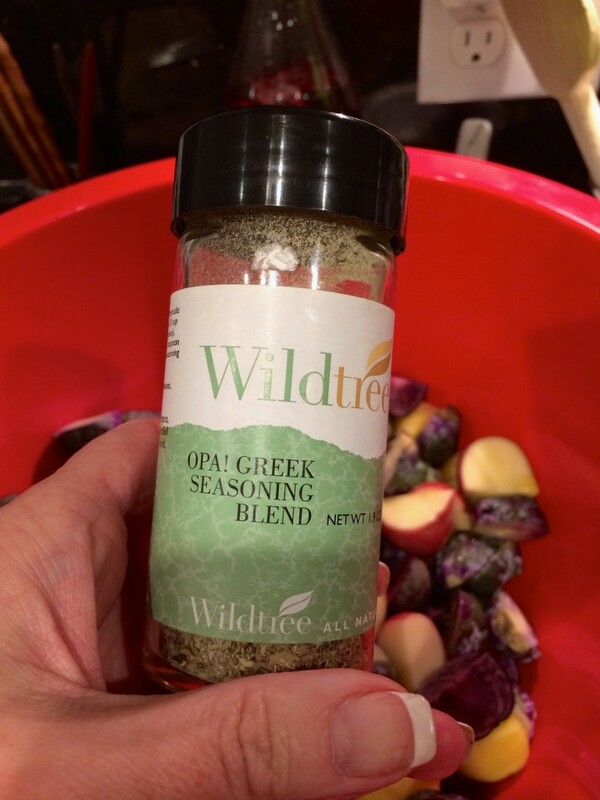 I used my WildTree OPA! Greek Seasoning, which you can buy here. Pretty soon, I’ll be selling this line myself! So check back for links to my store after the first of the year (2015). Use your hands to mix well. Put half the mixture in the bottom of the baking dish and the other half on a non-stick baking sheet. I do this so I get some pieces that are crispy, as well as some drenched by the chicken juices. 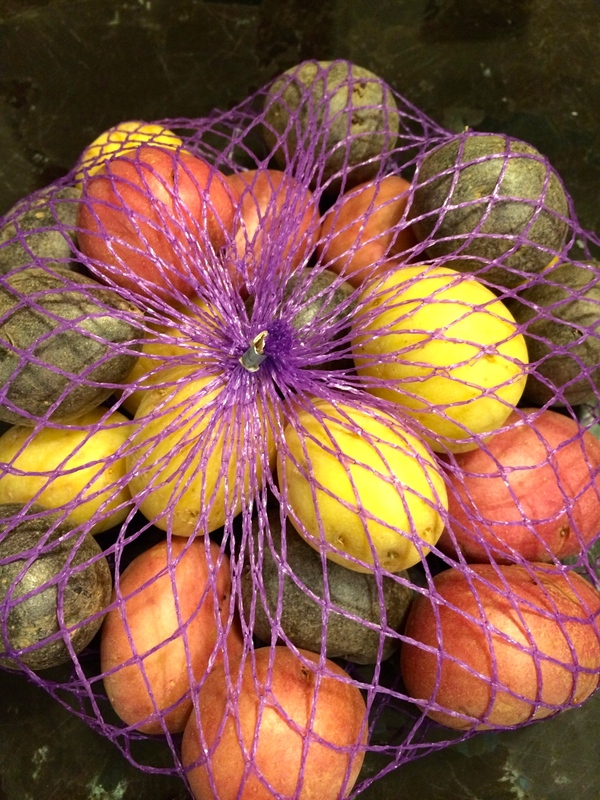 Remove any string or trussing from the bird. 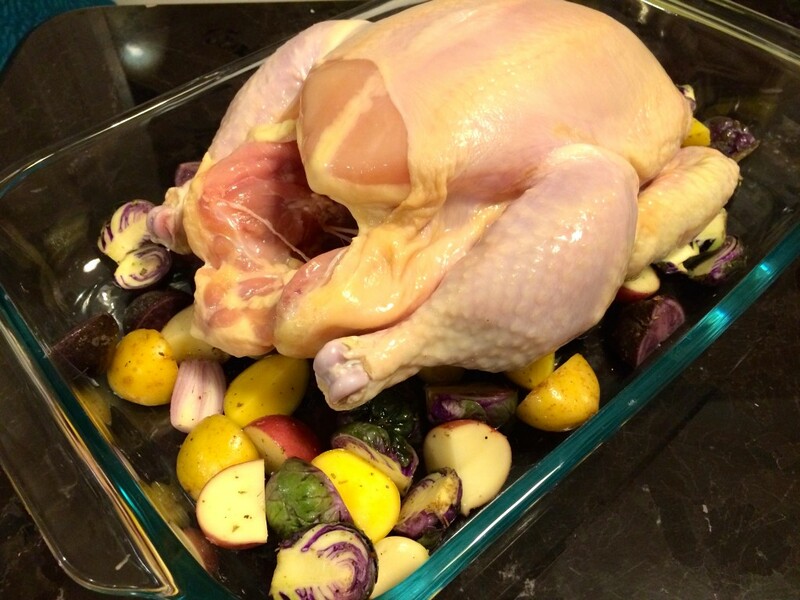 Remove the giblets from the cavity and lay the bird on top of the chopped vegetables in the roasting dish. 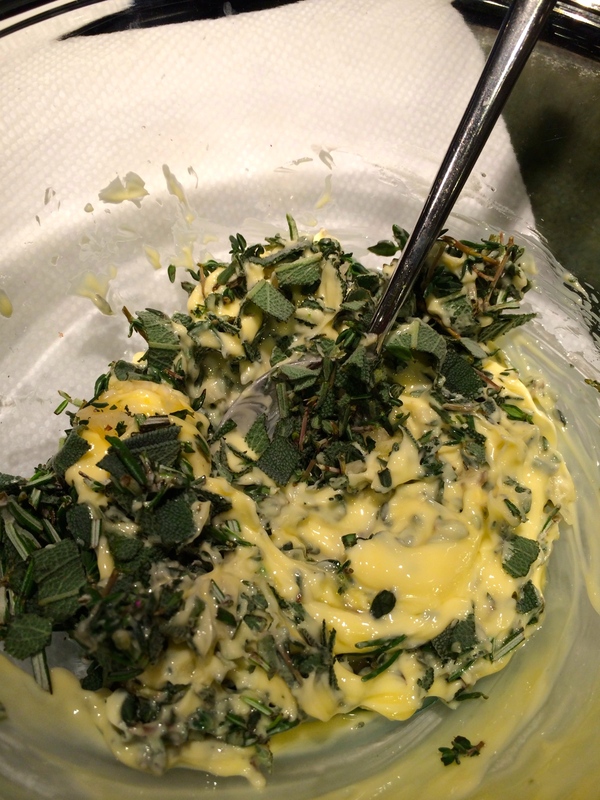 Put the butter in a bowl and mix the chopped herbs in. 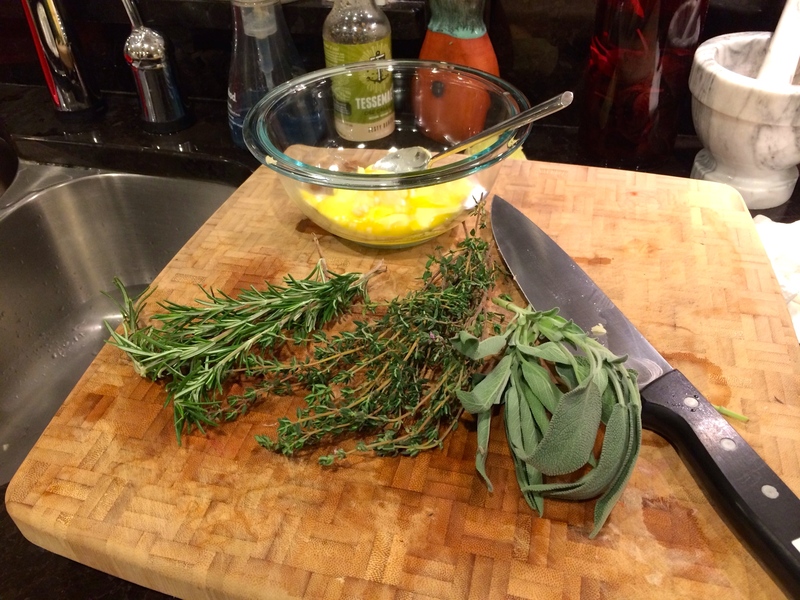 I used my hands for this, as there is more herb mixture than butter. This will be more of a paste, than a liquid. Grind a little salt and pepper onto the chicken and then spread the butter mixture all over the skin of the chicken. There will be a lot, so spread it out as evenly as possible and also place a fair amount into the body cavity of the bird. 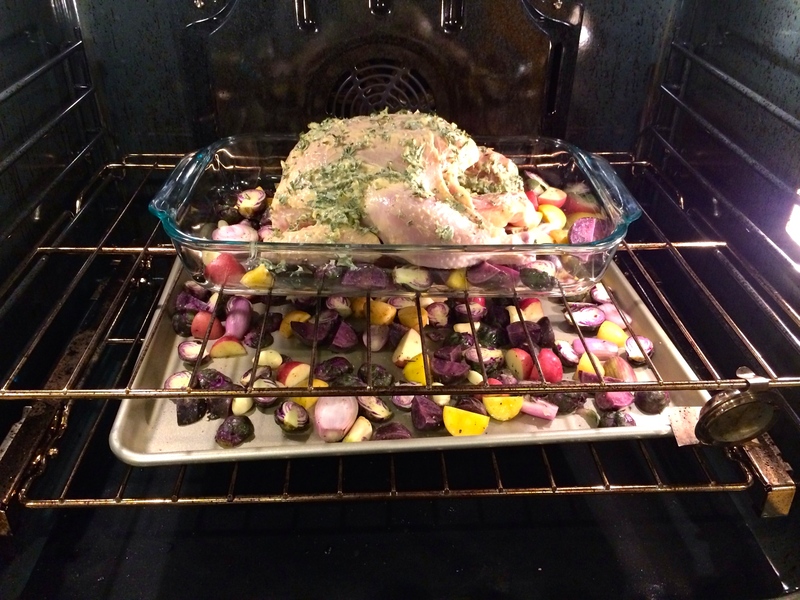 Place the baking sheet with the vegetables on the bottom rack (under the chicken) and put the roasting pan with the bird in the center of the oven and leave in for 30 minutes, or until the skin starts to brown a bit. Pour the chicken broth (or white wine) into the pan. Check the vegetables to see how they are progressing. They will be done when the are fork tender. Mine were almost done, but getting dry… so I sprayed them with some additional olive oil and put them back in for another 15 minutes. Turn the oven down to 375 degrees F, baste the chicken with the juices and chicken broth and roast for another 15 minutes (along with the veggies if necessary). 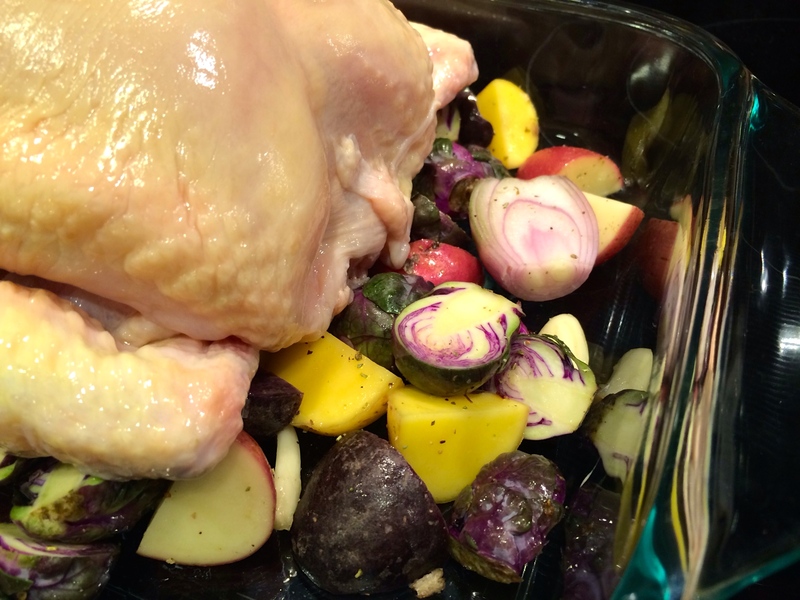 After 15 minutes, remove the vegetables (if they are done) and cover the bird loosely with foil and then roast for another 30 to 40 minutes, depending on the size of the bird. Baste as the juices form, about every 20 minutes. 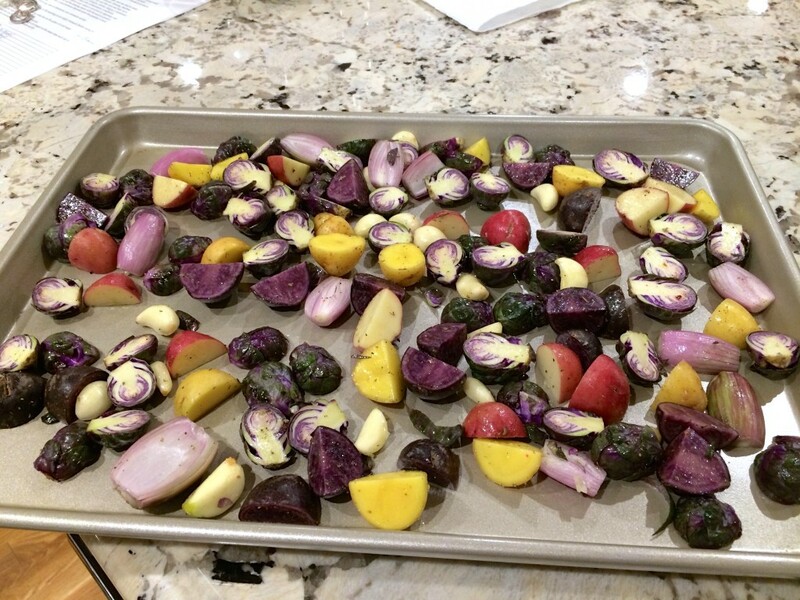 The finished veggies from the baking sheet. For the final phase, remove the foil, baste the bird again and let bird cook another 2o to 30 minutes or until the skin is nicely browned and the internal temperature of the bird reads 180-190 degrees F. Baste the bird as needed and also baste the potato mixture to prevent it from getting too dry. Once the chicken has reached the proper temperature, turn the oven off and leave the door open a crack. Let the chicken sit another 10 or 15 minutes. Be sure not to pierce the chicken’s skin during this entire process. Make sure the temperature reads 180 degrees…this isn’t done yet! 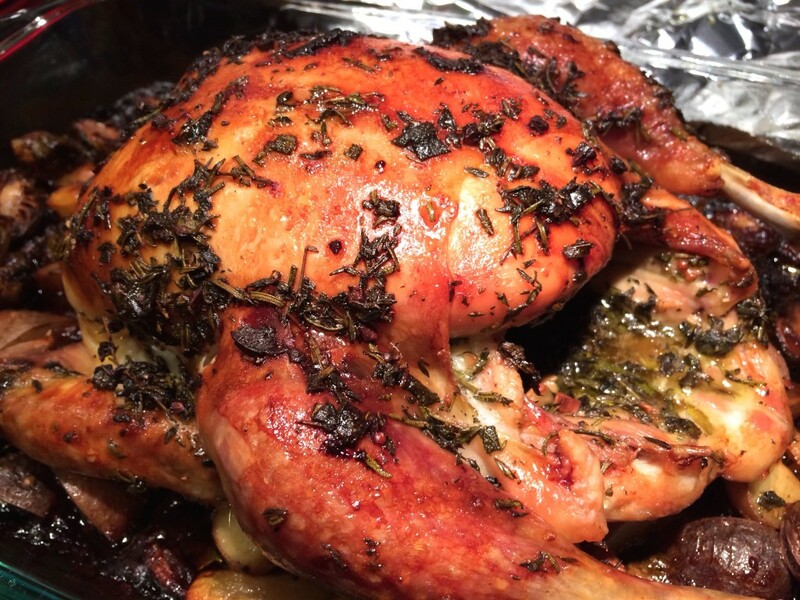 Remove the bird from the oven, place it on a warm plate, cover with foil and remove the potato mixture. Take the roasting pan, remove any fat and then make a gravy from the drippings, if you would like. 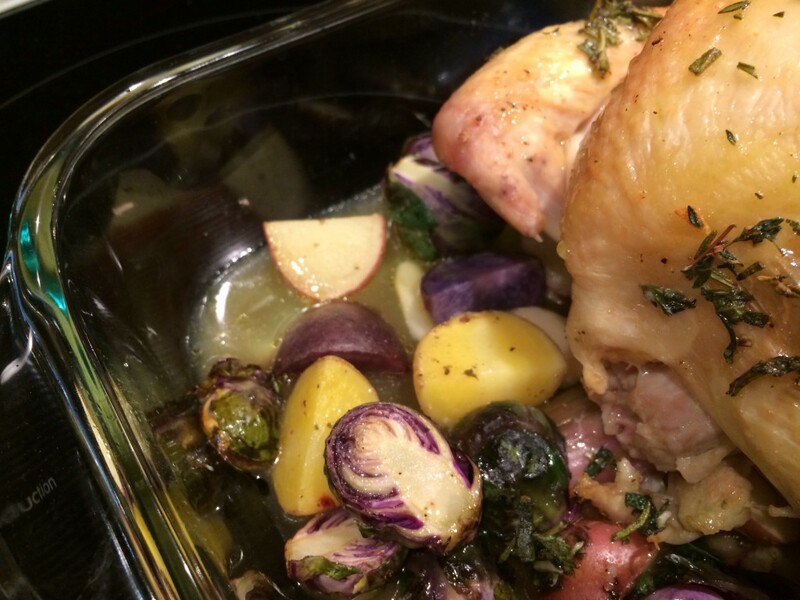 I had a hankering for some down-home comfort food last week, so I decided to roast a chicken. 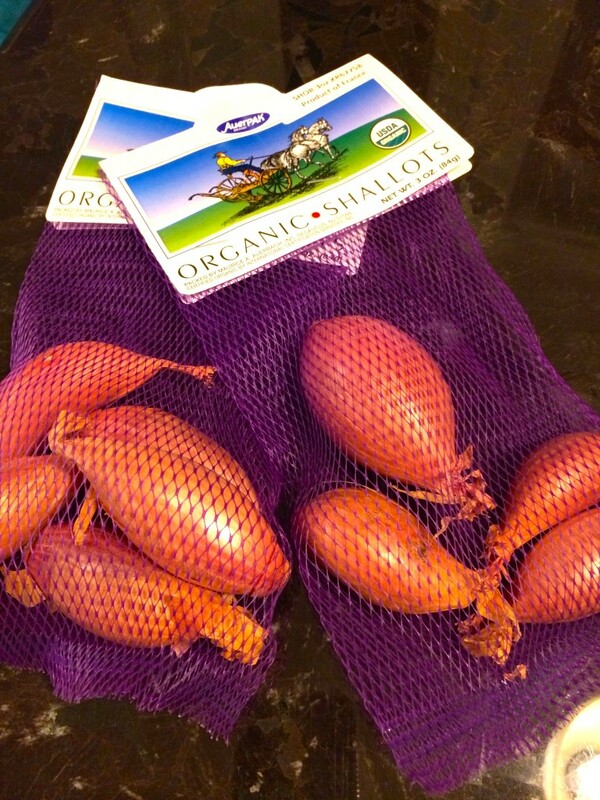 It had been a while, but I scoured my books and some favorite foodie websites to come up with the perfect recipe. I found a few, so I took a little from this recipe and a little from that recipe and came up with my own rendition. 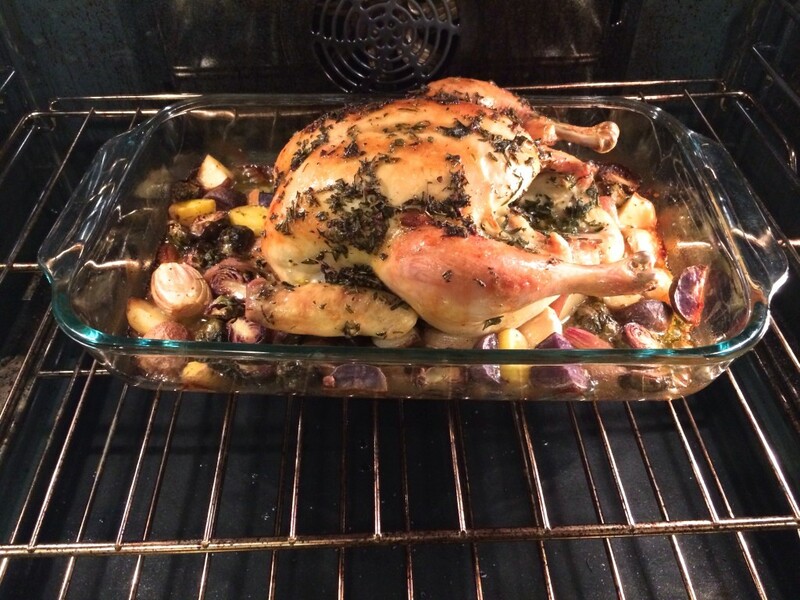 The chicken came out AMAZING and the roasted fruit and veggies it sat on top of where delicious. Sorry… no pics though. This was BEFORE I got my new camera! Remove any string or trussing from the bird. Remove the giblets from the cavity of the bird. Wash bird, both inside and out with cold water. Pat dry with paper towels. Line a baking dish with the copped onion (left in chunks), apples and potatoes. You can really add anything you want here, including chopped carrots, parsnips, etc. — but this combo tasted really nice with the chicken. Sprinkle mixture with a little salt and pepper. 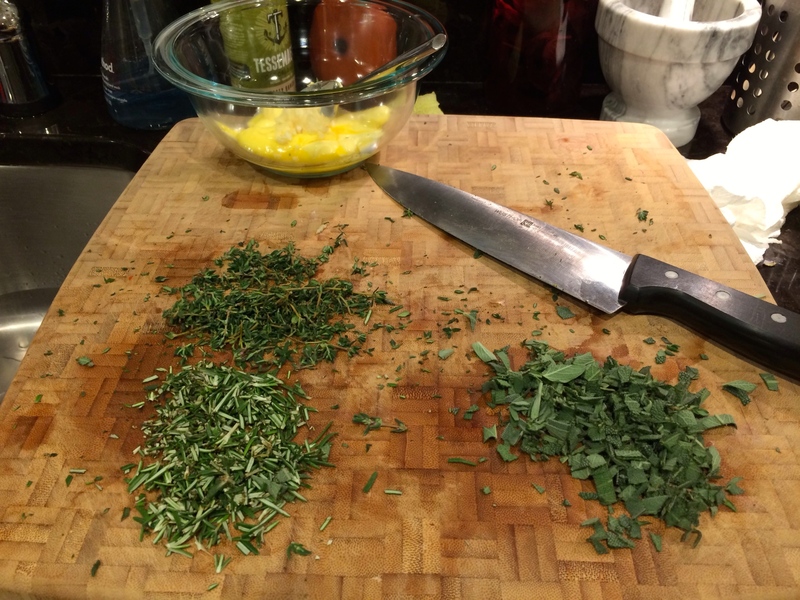 Put the butter in a bowl and mix the chopped herbs in. I used my hands for this, as there is more herb mixture than butter. This will be more of a paste, than a liquid. 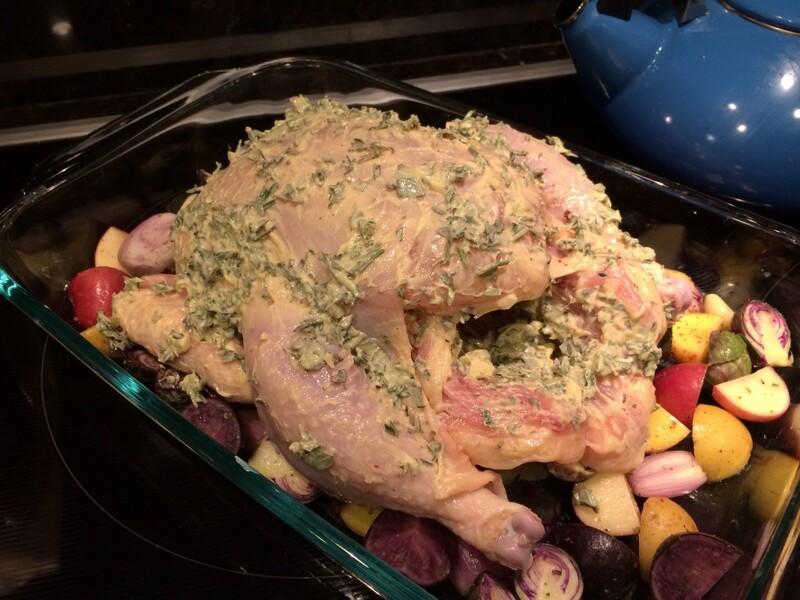 Lay the chicken on top of the potato mixture, bottom side down, and spread the butter mixture all over the skin. There will be a lot, so spread it out as evenly as possible and also place a fair amount into the body cavity of the bird. Drizzle a little olive oil over the exposed potato mixture. 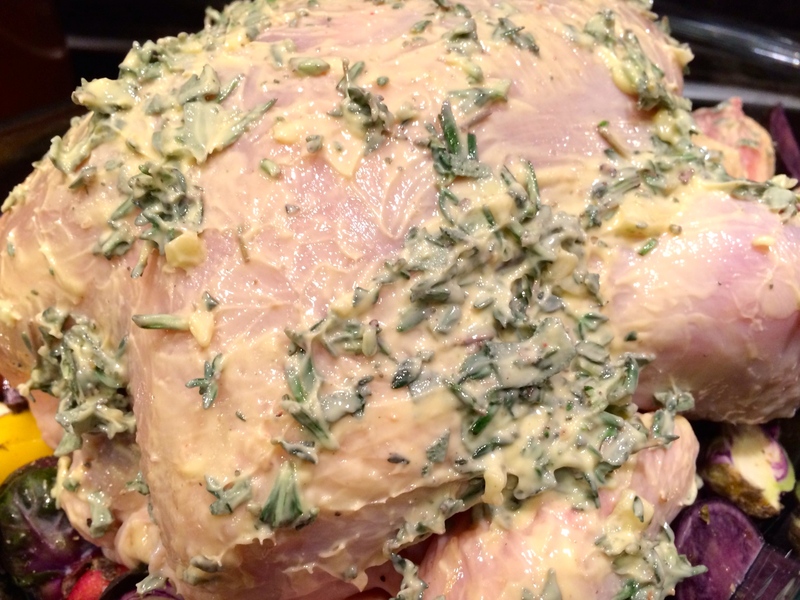 Place the bird in the center of the oven and leave in for 2o to 30 minutes, or until the skin starts to brown a bit. Baste the chicken with any drippings that have formed thus far. Pour the white wine into the pan (but not over the bird). 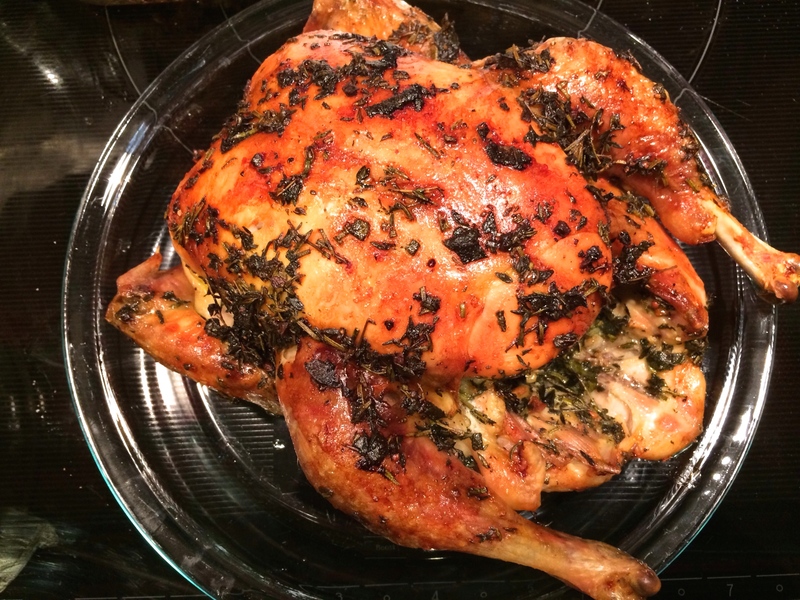 Turn the oven down to 375 degrees F, cover the bird loosely with foil and then roast for another 30 to 40 minutes, depending on the size of the bird. Baste as the juices form. 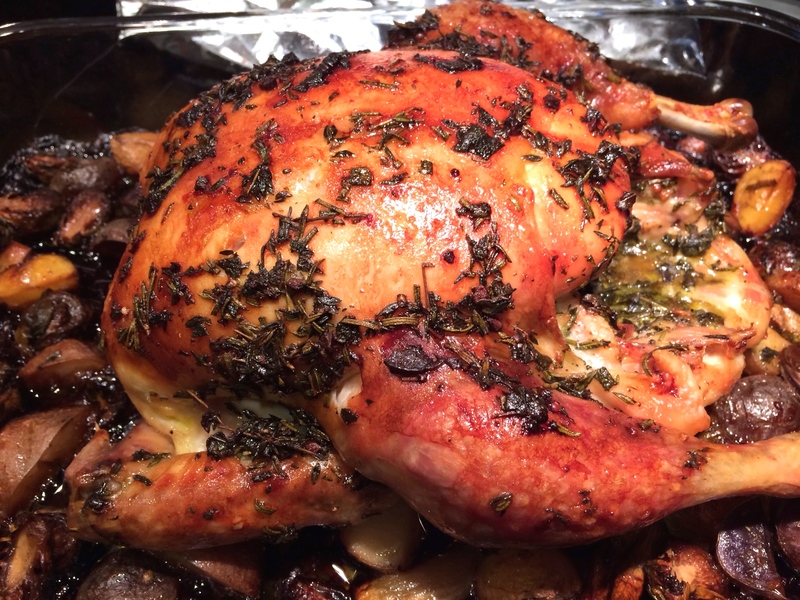 Remove the bird from the oven, place it on a warm plate, cover with foil and remove the potato mixture. Try to keep everything warm by letting it sit onto of the hot oven. 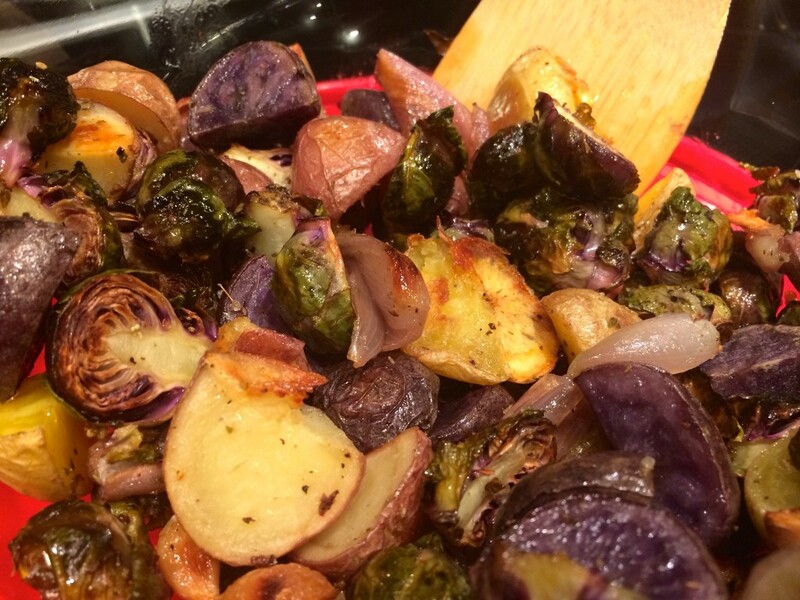 Take the roasting pan, remove any fat and then make a gravy from the drippings. 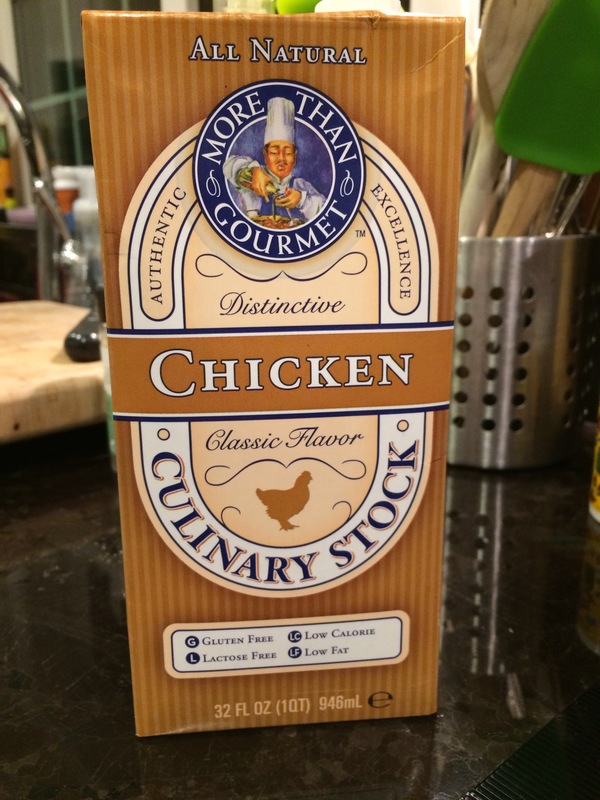 I just use an organic instant-chicken gravy pouch that you add water to. This is a VERY good dish. 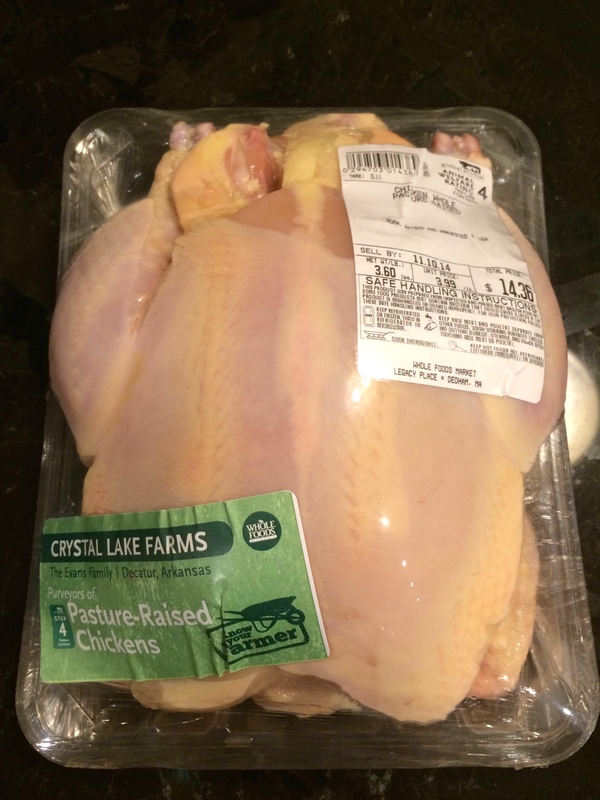 Watch the times based on the size of your chicken, because you don’t want to dry it out. I had a pretty big bird… it was probably 6 or 7 pounds, so you may want to adjust. 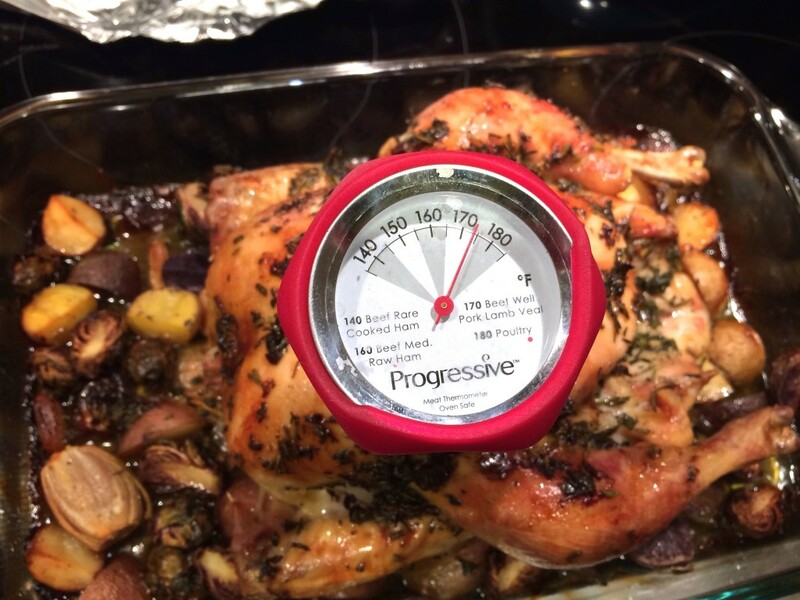 Also, make sure you have an oven thermometer and a meat thermometer to truly follow the temperatures accordingly.